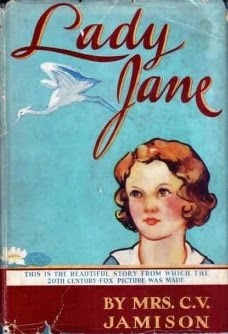 In Child Star Shirley says that after the release of Little Miss Broadway Darryl Zanuck announced that her next picture would be an adaptation of Lady Jane by Mrs. Cecilia Viets Jamison. Published around the turn of the 20th century (1903, as near as I can tell), the novel told the Dickensian tale of an orphan girl in New Orleans of the 1890s. Little Jane and her gravely ill mother, having fallen on hard times, are taken in by a Mme. Jozain, who, seeing the fine clothes in their luggage, calculates that she’ll be well compensated for nursing the mother back to health. But the mother dies, leaving the girl in Mme. Jozain’s hands to be exploited and abused, her only friend a blue heron. All ends happily, of course, but we needn’t go into it any deeper than that. In trolling around the Internet looking for information on the book — it’s apparently out of print, but used copies are widely available — I found this. It’s a 1935 edition published by Grosset & Dunlap, a firm that often published movie novelizations and “motion picture editions” of classic books. As you can see, the dust jacket says, “This is the beautiful story from which the 20th Century Fox picture was made”. However, Grosset & Dunlap seem to have jumped the gun; Lady Jane was never filmed, with Shirley or anybody else. Could it be that Fox purchased the book as early as 1935, anticipating making a movie, even though Shirley doesn’t mention it coming up until three years later? In any case, nothing ever came of Lady Jane. Other titles were tossed in the hopper, including one suggested casually by U.S. Treasury Secretary Henry Morgenthau over lunch with Shirley and her mother: The Little Diplomat. On Zanuck’s orders, The Little Diplomat got as far as a treatment by studio writer Charles Beldon and a first draft by Eddie Moran, then withered on the vine. Another proposal, the 1936 children’s novel Susannah of the Mounties by Canadian Muriel Denison, went the distance, as we’ll see later. But for now, in the fall of 1938, Fox yet again turned to an old Mary Pickford vehicle. This time more than just the title would be used, and curiously enough, the story had some elements in common with Lady Jane. The result would be the glittering apotheosis of Shirley’s career at 20th Century Fox. Unlike Lady Jane, A Little Princess has never been out of print since it was first published in 1905. It was the work of Frances Hodgson Burnett, who was born in England in 1849 but lived much of her adult life in the U.S., where she became a citizen in 1905, and where she died and was buried in 1924. She began writing short fiction for magazines while still in her teens, later progressing to romantic novels for adults and sentimental books for children. Her books sold well all her life, enabling her to support a transatlantic lifestyle with homes at various times in America, in England and on the Continent. Her adult novels were all popular in their day, but it’s for her children’s books that she remains best remembered, specifically Little Lord Fauntleroy (1885), The Secret Garden (1911) and A Little Princess. A Little Princess first appeared in 1888 as a serial in St. Nicholas Magazine under the title Sara Crewe: or, What Happened at Miss Minchin’s Boarding School. In 1902, Mrs. Burnett turned the story into a play, A Little Un-fairy Princess, the title later shortened to A Little Princess; in January 1903 the play opened in New York (with “The” replacing “A” in the title). About the same time, Mrs. Burnett set to expanding the original story into a complete novel, and the book (full title: A Little Princess; being the whole story of Sara Crewe now told for the first time) was published in 1905. In the novel, Sara Crewe is the seven-year-old daughter of a well-to-do British Army captain serving in India. Pampered without being spoiled, Sara is brought by her father to be educated in England, away from the unhealthful Indian climate. He enrolls her in Miss Minchin’s Select Seminary for Young Ladies, where the proprietress, Miss Maria Minchin, continues the practice of pampering Sara, albeit more for love of her father’s money than from any affection for Sara herself. In fact, Miss Minchin dislikes and resents Sara for her native intelligence, her scholastic aptitude, and her self-possession, which Miss Minchin regards as impertinence. Sara spends four years at the school, fawned over (insincerely) as Miss Minchin’s star pupil. Then, just as Sara turns 11, her father suddenly dies, his health and spirit shattered by a series of financial reverses that have left him, and now his orphaned daughter, penniless with no friend or family to turn to. Miss Minchin’s resentment boils over at the thought of the luxuries she has lavished on Sara, expecting to be reimbursed by her father. She confiscates Sara’s fine clothes and evicts her from her well-appointed room. Henceforth, Sara will be expected to continue her studies while earning her keep as a scullery maid and all-around drudge, doing chores and running errands at all hours and in all weathers, wearing threadbare, ill-fitting clothes, sleeping in the attic with the rats and the discarded furniture, and taking what nourishment she can from the scraps of food thrown to her — that is, when her “meals” are not withheld for some imagined infraction or other. Sara endures two years of this shabby abuse with stoic dignity, years in which both she and Miss Minchin show their true colors. In the end, Sara’s virtue is rewarded. While her father has indeed been lost, it turns out that her fortune has only been mislaid, and is now returned to her a hundredfold. She sweeps out of Miss Minchin’s clutches richer and more a “little princess” than she ever was, while Miss Minchin is left to gnash her teeth and contemplate what will become of her if word of how Sara was treated ever gets around. Ethel Hill and Walter Ferris’s script took major liberties with Mrs. Burnett’s story while retaining its basic structure. To spare Shirley having to age from seven to 13, they confined the action to a single year, 1899 to 1900. Capt. Crewe has been ordered from India to Africa to fight in the Boer War, and is reported killed at the siege of Mafeking. However, we soon learn that he was not killed but is only missing in action, and is being cared for in a hospital right there in London, a semi-comatose amnesiac whose identity is a mystery to those who are tending to him. Whether Capt. Crewe is dead or missing, the effect on Sara and on Miss Minchin (Mary Nash, still in villainess mode from Heidi) is the same. The difference is that Sara refuses to believe the reports, and she haunts the very same hospital whenever she can steal away from the school, always searching for her father but never finding him, asking after him but never asking anyone who knows about that mysterious unknown patient. In the end, with a gentle assist from Queen Victoria (Beryl Mercer, serving much as Frank McGlynn’s Abe Lincoln did in The Littlest Rebel), Sara is finally reunited with her father. The change is crucial: for this Sara Crewe, the happy ending is not regaining her fortune, but regaining her father. 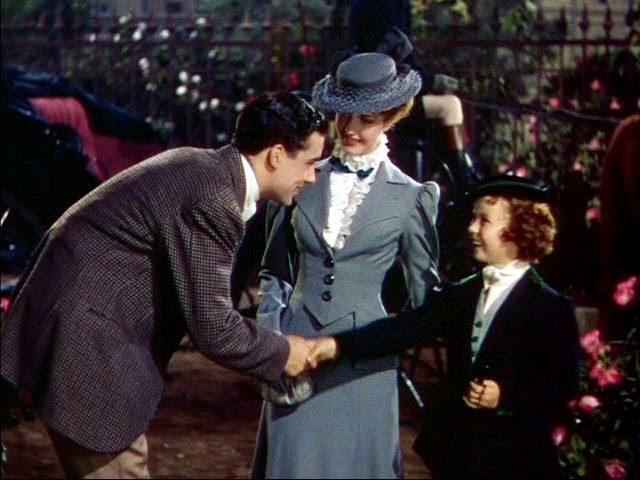 Hill and Ferris also added a romantic subplot involving Rose (Anita Louise), a teacher at Miss Minchin’s, and Geoffrey Hamilton (Richard Greene), the school’s riding master (seen here with Sara before the downturn in her fortunes). Geoffrey is the semi-estranged grandson of Lord Wickham (Miles Mander), who lives next door to the school, attended by his Indian servant Ram Dass (Cesar Romero). Miss Minchin takes cruel delight in breaking up Rose and Geoffrey’s romance and discharging Rose, thinking it will curry favor with Lord Wickham. Meanwhile, Ram Dass, crossing the roofs from his attic room to Sara’s, has seen the wretched conditions under which she’s forced to live. Sara tells him of all the comforts she pretends her cold, dusty garret has. Later, with the approval and connivance of Lord Wickham, Ram Dass sneaks into the room while Sara sleeps and installs all the comforts she has only imagined — down quilts, soft cushions, cases of lovely books, food on the table and a warm fire in the grate. In this way the movie includes one of the charming touches in the book, changing the source of the mysterious largesse by establishing Lord Wickham as the curmudgeon with a heart of gold that has by now become a standard element of Shirley’s pictures. The movie also provides Miss Minchin with a brother Bertie (Arthur Treacher) — “our professor of elocution and dramatics. “Bertie is also a former music hall entertainer, although Miss Minchin is too much of a snob to allow him to admit to it when Sara’s father remembers having seen him perform. And this is all the excuse the movie needs to put Sara and Bertie through a couple of quick song-and-dance choruses of the 1882 Albert Chevalier chestnut “The Old Kent Road” — first here in Miss Minchin’s parlor (when she’s not around, of course), then later at the hospital to entertain the convalescent soldiers. Indeed they had, but more happily than in Heidi. 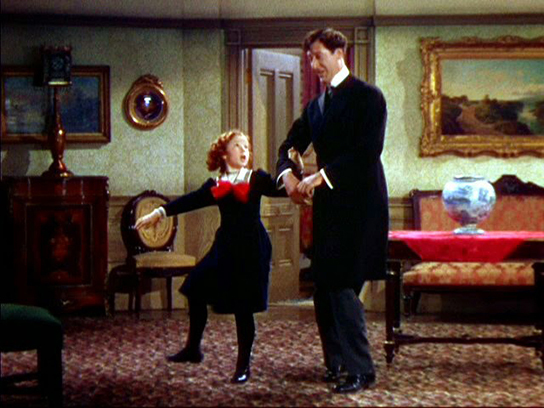 The Little Princess demonstrates the difference between working to Shirley’s strengths and depending on her tricks — never more so than in this sequence, which comes at the picture’s two-thirds point. Sara is asleep in her garret; while she sleeps, Ram Dass steals in through the attic window and bedecks her room with comforts and finery — but we won’t know that until later because we are in Sara’s dream. She dreams she’s a princess holding court, with (like all dreams) people from her life taking their roles. Bertie is her court jester, Ram Dass her lord chamberlain (perhaps Sara, even asleep, is half-aware of his presence? ), and Miss Minchin is there filing charges against Geoffrey for stealing a kiss from Rose. The scene is spoken in rhymed verse written by Walter Bullock, set to music by Samuel Pokrass (“There, you see, he broke the law! / What I say I saw, I saw!”). Geoffrey is acquitted because the kiss wasn’t stolen, it was given freely by Rose (“There, you see! I had a feeling / This was not a case of stealing.”), and the accuser is banished from Princess Sara’s realm. There follows a round of entertainment from the court dancers (to a genteel arrangement of “The Old Kent Road”), in which a new prima ballerina (who looks very much like Princess Sara herself) wins the approval of the court. As the dance ends, Sara awakens to find her room transformed — so completely transformed that at first she thinks she must be still asleep and dreaming. For Shirley’s next outing, it was back to black-and-white, and a follow-through on one of the projects that had been back-burnered in favor of The Little Princess. We needn’t spend much time on Susannah of the Mounties. Muriel Denison’s novel, published in 1936, was the first of four she would eventually turn out; the sequels were Susannah of the Yukon, Susannah at Boarding School and Susannah Rides Again. This first book told of a nine-year-old Canadian girl in 1896 sent to live with her uncle when her parents are assigned to a remote corner of the British Empire. The uncle, an officer at a Royal Canadian Mounted Police outpost in the wilds of Saskatchewan, is at first surprised and unwelcoming, but Susannah soon wins his heart, along with those of everyone else on the post. My own copy of the book is still on order; when I’ve had a chance to look it over, if there’s anything more to be said about it, I’ll post an update here. But I suspect there won’t be, because once again 20th Century Fox jettisoned everything except the title. The script was credited to Robert Ellis and Helen Logan (story by Fidel La Barba and Walter Ferris), but several other writers put their oars in without credit — never a good sign. Yet again, Shirley played an orphan: Susannah Sheldon, sole survivor of a wagon train massacred by renegade Blackfeet Indians in the 1880s. She is found by Mountie Randolph Scott out on patrol, and more or less adopted by him. From her place on the post she becomes embroiled in tensions between the Canadian Pacific Railroad and the Blackfeet tribe, especially after she befriends the son of a Blackfeet chief sent to the post as a hostage against good behavior. Together Susannah and Little Chief (played by a 13-year-old Blackfeet youth named Martin Good Rider) intervene with his father Big Eagle (Maurice Moscovich) to thwart the warmongering of the villainous Wolf Pelt (Victor Jory) and “show White Man and Indian how to live as brothers.” Peace pipe smoked, fade out. 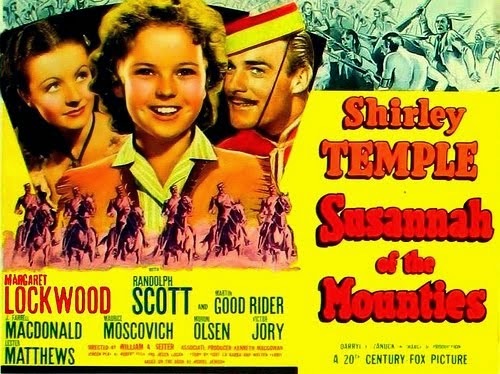 Susannah of the Mounties was directed by Wiliam A. Seiter, one of Shirley’s favorites, who had already directed her in Stowaway and Dimples. 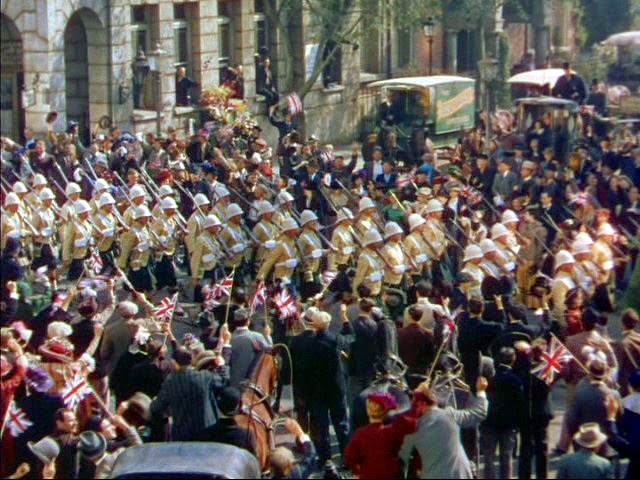 Some scenes were directed without credit by Walter Lang (Seiter had performed the same fill-in duty on The Little Princess when director Lang left on “medical furlough”). Shirley’s next picture would reunite her with Lang. Once again, Shirley and Lang would be working in Technicolor, and the production would be, if anything, even more lavish than The Little Princess. Results, however, would differ sharply. For the first time, a Shirley Temple picture would lose money. I would have to agree with the critics re: "Susannah and the Mounties". I find that movie a bit of a chore. 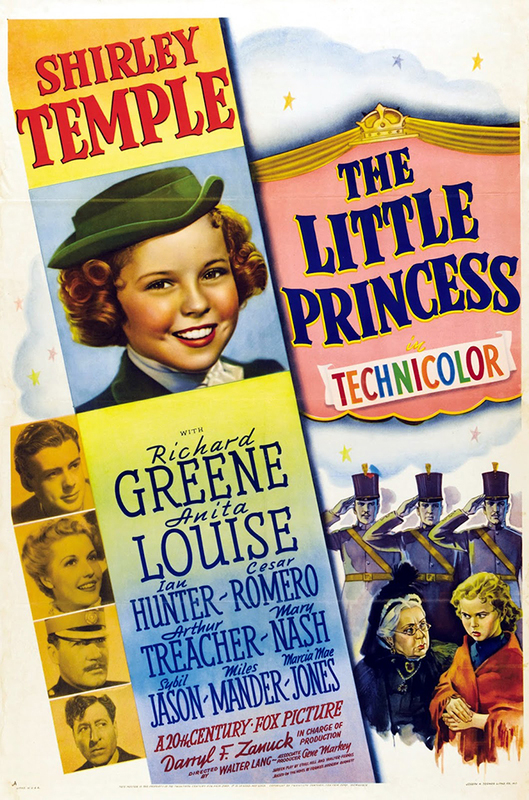 "The Little Princess", however, is one I really enjoy despite the liberties it takes with the original story. Am really enjoying this series! Great post! SUSANNAH is definitely a weak picture, but my daughter was such a Temple fan that we watched that one – and pretty much all of the others – anyway. Thanks, Silver and Jennifer! I've just received my copy of the Susannah book, and from what I can tell so far, it seems to be a kind of female-Tom-Sawyer-on-the-Canadian-frontier type of story. I'll know better when I've read further, but offhand I'd guess that Mrs. Denison's original story would have made a better vehicle for Shirley than the moth-eaten B-western plot that Fox concocted.